The folks over at Hackspace London have been working hard to create a “very low cost, open source, Internet connected platform on which others can develop their ideas”, which they have dubbed “Nanode”. Essentially an Arduino with Ethernet networking on-board, the Nanode is armed with an ATMega 328 microcontroller along with all the other standard goodies you would expect from an Arduino-compatible device. The Nanode can be controlled with a web browser right out of the box, thanks to some custom Ethernet libraries. Additionally network of Nanodes can be easily configured to communicate with a “master” unit via a multidrop serial bus, allowing the device to be used for a wide array of distributed control tasks. Obviously most of these features can be had in the form of an Arduino Ethernet board, or achieved by using an Ethernet shield. The Nanode is a touch cheaper than either option at $40 for a kit, and the native networking capabilities sound like they would be quite handy. That said, we are a bit bummed that it only has 10BaseT networking capabilities, though it is always nice to have options when it comes to choosing a microcontroller board. 10BaseT is not a big point, the ATmega will not be able to use the whole 10Mbit anyway. Who cares if it only has 10Mbs, There is no way it will handle a data stream of even 256 kbps….. Finally! An arduino clone that mimics the most important function: a DIP socket. It’s all nice and fancy that therer are Teensys, Fezs, Netduinos, all sorts of nice flavours, but if a dev board is $20, and microcontrollers for them are $5, you better make sure I can swap them around.. This looks pretty nice… really nice. Not only are the network libs pre-loaded, but I notice they say you can upload new sketches using TFTP. That’s AWESOME! I have an ethernet Arduino Uno which talks to an Asus wireless access point ($10 on rebate). It works pretty well, but when I want to update the code I have to go over and plug my USB in. Ethernet flashing looks good! Close, but not quite the same thing. That looks more like a replica of the Arduino Ethernet board, minus the SD slot. Also, everyone can take the 10BaseT comment with a grain of salt – occasionally we will point out a design choice that might be an obvious nitpick, in order to prevent a deluge of “zomg but it only XXXXXX!!! !” comments. I picked wrong this time. This guy also has a few more I/O ports than the Arduino, so it’s got that going for it as well. I forget how many, to be quite honest. Wow.. this is what I’ve been waiting for! quite nice. and as said, 10Mbit should be more than enough. Anyone on here has also experience with the AVR-NET-IO? The AVR-NET-IO is an interesting platform, but suffers from a couple of downfalls compared to the Nanode. Basically, it’s not very development-friendly because pins aren’t broken out to anything useful (just a couple of screw terminals for the ADCs and a big DB-25 or similar plug for the rest), so you’d need to make your own cables for breadboarding. I find the Nanode quite appealing because it runs the Arduino bootloader, so development should be more or less hassle-free. Can anyone comment on the code size of the libraries supplied with the Nanode? ATMega328’s are expensive and their availability is so-so, whereas their smaller brethren can be bought for a much more reasonable price. An open source alternative is the web platform from seeed studios. Available for $37 shipped. Already has the FTDI232R so you don’t need any other hardware to program. I don’t think you can program over ethernet but that seems like a possible vulnerability as well as a feature. Thanks from all of us on the Nanode Dev Team for covering the Nanode Project on Hack-a-Day. If you are in the US or Canada please contact http://wickeddevice.com/ as they are the exclusive US resellers. The Nanode sells for $39.99 and comes with a year’s Pachube Pro subscription – worth $25. I looked in the specs but didn’t see anything but this does support POE right? This does not claim to support POE. However, Little Bird Electronics DOES have an Arduino with onboard Ethernet AND it supports POE – the EtherTen. Take a look… this is an AMAZING Arduino. It is a crying shame you can not get these in the USA (unless you order direct from Australia). I emailed Little Bird about US availability, and they expressed frustration that some US maker sites expressed interest but never came through. The official Arduino platforms need some updates, in my opinion. Would be nice to see standardized: micro/pro sized SMD 3.3v version with onboard 433MHz radio (like the JeeNode SMD), a shield-sized one with onboard ethernet and POE, and a shield-sized one with onboard wifi. These all do exist, but are carried here and there by custom manufacturers. Some standardization and higher production would do great things for the costs and adoption. If you are going to put ethernet on a microcontroller it seems silly to not support POE. If you are saying that Ethernet is not “worth it” without POE, a lot of folks would disagree with you). The only POE enabled Arduino ethernet boards I know of are the EtherTen and the Nanode. Neither are very easy to find in the USA (though it looks like the Nanode is close to real US distribution). Why does everybody want to stick things like Ethernet on an Arduino ? You can’t properly handle even 10 Mbps ethernet with a 20 MHz 8 bit device and if you do it will be with a shield that embeds a more powerful device than the Arduino itself, so what’s the point ? There are dozens of ARM or even FPGA devices out there that can handle 100 Mbps networking for 10$. I think the idea is that you already have Ethernet in your home. If you already have sketches/etc written for a familiar board and want to add Ethernet functionality without a lot of overhauling, this is the way to go. Sure an FPGA or ARM would be faster, but do you really need 10 or 100MBit speed to turn your lights on and off? Also when you go from 8bit micros to FPGAs there is a steep learning curve, which is not always appreciated. Because it is often about the wiring and not the bandwidth. Suppose you already have a network in place and you want have this device send data to a pc. You could run a serial cable but that is a pain. You could get a pair of ZigBee radio but that is more expensive. Blue tooth? Again more expensive. This is cheaper than a lot of RS-232 to TCP/IP devices I have seen. You could possibly write an SSH client for this and have it interface with the terminal. I don’t know if this device has the CPU power for the encryption since I have not worked with the arduino. If it doesn’t you could still use it as a display with a little custom code. Or interface with a few other parts like a thermometer, buttons, and and LCD display and make an net-workable thermostat for your home. Another use for this would have been an old phone system we replaced last year. It would log calls and was controlled over an RS-232 serial port. We had an old PC running a terminal hooked up to deal with it and a network cable into the PC. This board would have allowed us to remove the PC from the loop. We could have also used it to monitor the UPS for the phone system and even interfaced it to toggle the power on it by remote control for power cycling. I bought one 2 weeks ago. Very nice!! Easy to use even for newbie like me. Examples are very helpful to newbie. Now the open question is, how to make use of it? That’s easy, use it to take over the world (said in the voice of brain). That’s what all these hacks are intended for anyway right? Use it to remotely control appliances (providing a suitable sized relay) or turn on a light when you are not home. Use it to remotely program your DVR (using an IR). You’ll also need a dynamic DNS service like TZO or easydns for these remote management tasks. How about a home weather or power management station which uploads stats to Pachube? When I designed the hardware for Nanode, I worked to a very tight budget. It had to appeal to college students, amateurs and hackers. Working in association with the London Hackspace I fixed the price (for members) at £18 ($30) and we initially built a batch of 100 units. We ran a couple of weekend workshops and built them up from kits. Shipping costs were not included – and we have seen a rise in some of the IC prices since then. That was in early June. Since then we have produced a total of 550 pcbs so far – and shipped 450 of them. Nanode is now available in the US, exclusively from http://wickeddevice.com in upstate New York. Wicked Device will soon be making their own run of pcbs ready on the market in time for the NYC Maker Faire. From the start, Nanode had to be simple and straightforward to build – with conventional through hole components and socketed ICs. Following our pictorial assembly guide, I have seen dozens of Nanodes built by beginners – often their first real soldering project. 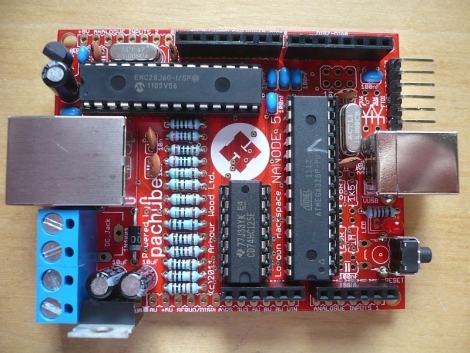 We are not trying to compete in any way with 32bit ARM devices – but we wanted a board that worked like an Arduino with a few extra features, such as ethernet connectivity and easy wireless and wired networking. Nanode is intended as a starter kit for web connected devices such as remote control, home automation and smart sensors. Later on there will be other variants, with built in wireless and available as a very compact SMT module. Nanode does not yet offer PoE, and you will need a FTDI or similar USB to serial adaptor cable to program it. In that respect it is similar to the standard version of the Ethernet Arduino – but a fraction of the price. Nanode is looking for resellers in Europe and Asia. If you want to get involved either commercially or join in with collaborative development, please contact me via @Monsonite on Twitter. I suppose (but do not know for certain) that modding for POE might involve hijacking an unised pin from ETH PHY. Then running a jumper to the Nanode DC in. Or is there much more to it? If you plug a 10MBit device into a 100MBit network, won’t the whole network slow down?? No, not if your router is a switch, and just about all of them are. I’ve bought parts from them a number of times and it’s worked out really well each time. The ENC28J60 is also easy to program with a small register set and has a good datasheet with few significant errata. Aah, really is something that should have been there. And 10 Mbit is really too much for the controller. It’s not like you’d transfer huge amounts of data. Twitter updates, Web controlled home automation, a tiny webserver… that’s about all you can do. Got mine this week and soldered it at the local Hackerspace (thanks again, guys!). Works like a charm!